Last week was my very pregnant best friend's birthday. When I questioned her about her birthday plans, she informed me that she had none. Well, if ever there is an excuse to eat cake, it is on your birthday. And if ever there is an even better excuse to eat cake, it is when you are pregnant on your birthday. Screw the birthday drinks - Stacy and I are much more of the birthday dessert kind of girls. And you may remember that I recently took a cake decorating class. So obviously, in my mind, I was pretty much the Cake Boss. I baked the cake (two of them for a double layer cake), the day before and froze them as instructed. You know, it is much easier to frost and decorate a frozen cake. So I learned. I prepared my mom's famous butter cream frosting which truly does not even need a cake. If it were socially acceptable, I would just put a bit S for Stacy in the middle of the bowl of frosting and call it a day. However, I charged on. I removed the cakes from the freezer and unwrapped them. In class, the cakes were a perfect solid mass of loveliness. In the Frank house, the cakes were a crumbling mess and cakey explosion. Nonetheless, I continued. 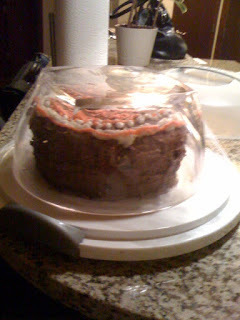 I set one cake down on the cake carrier bottom, put frosting in the middle and topped it with the second layer. Piecing the cake back together with frosting as I went. Dang, I thought to myself, I'm doing well! I've got a new career ahead of myself. I continued to frost the double layers. We learned all about these techniques with this spatula, and how to not get it all crumby. Well, that didn't translate so well at home. Cake and frosting meshed together to form a glue like bond as I touched the cake. Eventually, I got frustrated with the "chunks of cake in frosting" situation and just dumped the rest of the frosting on the cake. I then pulled out the detail bag and began to write "Happy Birthday"..."Happy Birthday S..." I ran out of room for Stacy. So I pulled off the S. This was going to be a more succinct cake. Just Happy Birthday. Cake...done. Except for one thing. My cake carrier was only tall enough for a single layer cake and this was double. Putting the top on would destroy my creation. My friend Jess was over, so she and Jeremy went on a hunt around our house for a creative way to package said piece of art (I mean cake). I hear a scream from Jeremy's end of the kitchen, "I've got it!" He comes running over with a large serving bowl in his hands. He plops the serving bowl atop my artwork. Done! He then grabs the duck tape and proceeds to duck tape the bowl on to the cake platter. Beautiful cake inside a salad bowl. I like to think it was just my artwork placed under glass. Or plastic. Whatever. I hear it tasted good, and that's all that matters. I am not typically a fan of strange foods. But these were dang good. Maple bacon cupcakes, with maple frosting and oh yea...that's bacon on top. Needless to say we all wanted to die a little bit when we left. But wow, amazing. I commiserate with the cake decorating.... every time the same thing happens to me, then i forget about it and attempt another elaborate cake.